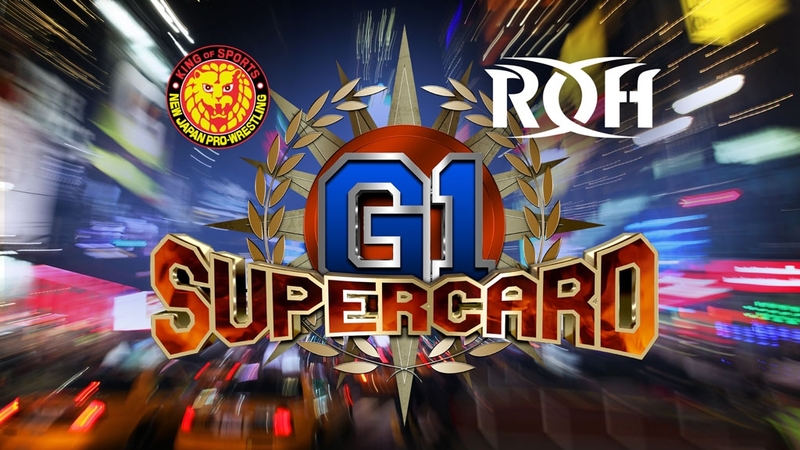 Well one thing was made abundantly clear at G1 Supercard; Ring of Honor needs NJPW way more than NJPW needs Ring of Honor. For a company that was once the pinnacle of in-ring wrestling (check out their 2004-2009 library if you don't believe me), ROH has fallen far indeed. Most of the ROH-centric contributions to G1 felt like I was watching TNA - a flat women's match that ended with Angelina Love and Velvet Sky laying out the new WOH Champion, a street fight that went from a singles match to a six-man and went on forever, Enzo and Cass of all people joining the promotion, and a solid but overlong ladder match with the least over guy walking away with the ROH Title. This was like watching two separate shows. One was pretty great, the other was kinda brutal. Just listen to the live crowd; they're all chanting "New Japan" during the intro, the New Japan-heavy matches all got great reactions while the ROH stuff was mostly muted. Hell, the show sold out last year with only three names having been announced: Okada, Naito and Tanahashi. ROH may have helped open the door for New Japan to grow their US audience, but New Japan sold out this show. Let me start though by saying how surreal it was to see these two companies in a sold-out Madison Square Garden. That factor added a ton of splendor to this show, and if you just watch the opener and the final six matches you'd have yourself a near-perfect PPV. I'm certainly not here to bash the show as a whole, this was the second-best big show of the weekend. The third match was to be Kelly Klein's crowning moment as the new centerpiece of the ROH Women's Division, but unfortunately the crowd basically didn't care about this at all. Klein and Champion Mayu Iwatani had a passable match that suffered from zero crowd heat, ending with two K-Power drivers and Klein standing tall as the new champion. Then Love and Sky came out, and Mandy Leon (who'd been the guest commentator) appeared to rush to Klein's aid only to turn on her. This was right out of an old Impact episode and the crowd pretty much hated it. The match itself gets **. The angle stunk. At this point I was thinking "Jeezus, this show is disappointing so far." Fortunately it was smooth sailing from here on out. So like I said before, as a New Japan PPV this show was fantastic, with six very different matches that all delivered in some way. As an ROH show this was not good, with one very good main event but nothing much else to show for it aside from ROH talent contributing to some of the interpromotional matchups. New Japan is insane if they don't seek a partnership with AEW. All Elite simply has too much great talent, and from what we're hearing a great TV deal on the table, for NJPW to not get something going with them. If ROH insists on New Japan working exclusively with them, they'd better rebuild in a hurry; ROH's booking on this show was not worthy of a company that once delivered the best in-ring action out there. This was a really freakin' good show, largely in spite of ROH's involvement, not because of it. What I'd Change: Cut the Street Fight to ten minutes and give five more to the opener. Cut the Ladder match by five minutes and give that to the Jrs. I know this was supposed to be a 50-50 show between the two companies but if you honestly think ROH brought as much to the table here as New Japan I dunno what to tell you. Most Disappointing Match: I had higher hopes for a Bully-Juice street fight. Most Pleasant Surprise: The 4-way tag match was insane.